Sean Gotkin is a Washington D.C. based recording engineer, producer and live sound engineer. He works as FOH lead sound engineer at local, iconic nightclubs the Black Cat and Iota Club and Cafe. As owner and independent operator of Blue Hippo Recordings in Centreville, he has several recorded projects out so far this year, including local rock/R&B group Crystal Youth and singer/songwriter Annie Stokes. Currently he is working on an album with reggae bastions Nappy Riddem. In his live incarnation, Sean has worked with local, regional, and national touring acts, such as Old 97’s, Rogue Wave, Sean Hayes, Kelley Deal (R. Ring), The Peach Kings & Quiet Company. Sean continues to strive to be the best at what he does, his focus and passion constantly trained on the local music scene and the raw talent it has to offer the collective. Brian: The track is Strawberry Moon and that was the music of Sean Gotkin. Let me tell you, Sean Gotkin is a fixture in the Washington DC. music scene. He's a Washington DC. based recording engineer, a producer and a live sound engineer. 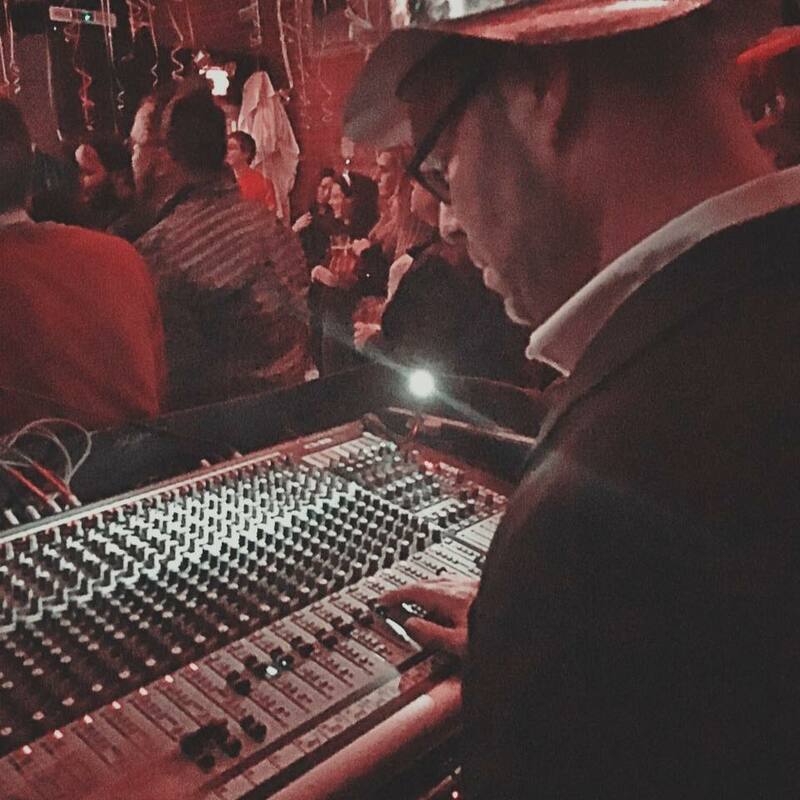 He's lead sound engineer at local and iconic night clubs in DC, The Black Cat and Iota Club and Café. He's the owner and independent operator of Blue Hippo Recordings in Centreville. He has several recorded projects out so far this year including local Rock/R&B group Crystal Youth and singer/song writer Annie Stokes, which we'll hear from a little later. Currently he is working on an album with Reggae Bastians Nappy Riddem, who we've proudly featured on the show, an incredible group. As a musician Sean has also worked local regional and national touring acts such as, Old 97's, Rouge Wave, Sean Hayes, Kelly Deal, The Peach Kings and Quiet Company. Sean continues to strive to be the best at what he does, and his focus and passion are constantly trained on the local music scene. The DC. music scene and the raw talent that it has to offer. Brian: The first time I met Sean was running sound at Iota, and he did an incredible job. I've been out to his house, I've seen the amazing things he's done with the recording space, and music is this man's life. It is such an honor and with great pleasure that I introduce to you Sean Gotkin. Say Hi. Sean: How you doing man? Brian: It is such a treat to have you here man. Sean: Thanks for having me here. Brian: Thanks so much for coming on the show. Sean: I appreciate the invite man. Thank you. Brian: That was Strawberry Moon and that was the music. So tell us about Sean Gotkin and the music and tell us about the professional. Sean: With Strawberry Moon basically, it's part of an EP I've been currently working on for the past 3 or 4 months. I'll probably be done by early next year and released by the early spring time. This was kind of a fast track single because it was just one of those songs that kind of just came to me very quickly, and there wasn't any waiting around it just kind of flowed out, so I just wanted to get it done and get it out there as fast as possible. Sean: As far as professionally, I do music really only part time now because sound pretty much takes up the rest of my free time that I might have. Brian: Run us through a week then. If sound takes up most of the time, what does that mean? Sean: During the days I'm always in the studio working on something, whether I'm mixing an audio bar, live studio project or one of the bands I'm working with, or just trying to tinker with something or play with sound and see what I can get out of the room. The rest of the time usually 6 sometimes 7 nights a week I'm either at Iota or The Black Cat doing live sound. Brian: Wow, so 6 or 7 nights a week, and then during the day. My goodness. Did I see on, I believe I saw on Facebook or something that there's a little one on the way too? Sean: There's a little baby girl coming in about 2 to 3 weeks. Cassidy Rose, very excited. Brian: Congratulations, that's really exciting. Sean: Thank you very much. Appreciate that. Brian: A new one on the way which means that your time is just going to get even more precious it sounds like. Sean: Even more precious, yes. Sean: For the second time. Brian: Already a papa bear, gonna add another one to that, which is no small feat. Tell us more, when your not doing those things what else are you doing? Sean: Usually hanging out with my kid Fynn, he's a little 5 year old boy, and he's one of the greatest things in my life, and I just love spending time with him, and talking with him. He's really big into music, I think he's going to be a drummer himself one day. We go down and play in the studio or he has his little toy corvette he loves driving down the street, we take that out. Sean: Also, I'm going out scoping out bands I love to go to shows and see new talent, see what's going on, keep my finger on the tab of what's happening here in the scene. Brian: You're at Iota and your at The Black Cat all the time, so when your going to shows are you going other places too? Brian: Where have you found, is there a hidden gem that you found among the travels at all that you've ...? Sean: There's always the hidden gems. I definitely have my favorites out of those hidden gems, but I try to get around to the whole area as far as the bigger venues and the smaller venues, kind of see what's happening in both. Brian: Got it. Tell me one thing you love about the DC music scene? Brian: I said one thing. Sean: That's the problem it's so hard to narrow it down. I've been engrossed in this scene for a very long time and I grew up in an age where the DC. scene was really blowing up in the late 80's early 90's. Fugazi had made there mark on DC., GoGo had come out of here. I remember that explosion, and then it dried up for a long time. Now the well is just pouring out again with all these amazing artists. Brian: Every week on the show there's just so many more, it's so exciting to see them all coming out. Tell us about your, either a best show or a success moment that you have? You said you've been in the business for a long time, so talk about a big success. What comes to mind? Sean: A big success, probably one of my favorite shows, probably one of the hardest things I've ever had to do and it came out as close to perfect as possible, was a show that local drummer Ben Tufts put together back in the spring. Itwas an almost tribute show. They were doing two albums back to back and it was 50 interchangeable musicians. Brian: 50, like 5-0, 50. Sean: 50, and on top of that a packed sold out room. It was interesting, trying to manage that and get everyone sounding as best as possible and trying to get as faithfully sounding to the records as possible. It was a blast. It flew, flew by. Brian: I bet stuff happens really quickly in that kind of scenario, just constantly. That's amazing. Beatles tribute show, amazing one. Tell us about a time that you tried and failed? Sean: I've had a few of those moments and through those moments I've found ways to push through and find success. When I first started off I was really hungry, and I was kind of concerned with the amount of people that where in my field and whether I was going to break through. Especially since I started in my mid 30's. I made the mistake that a lot of engineers make at first which taking on way too much at first. Cause you think you can handle it all. Then you kind of realize after awhile, well I'm just a human being and I only have so many hours in the day, it's more important to focus on several bands or one band at a time than it is 5 or 6 bands at a time, and try to manage that with a live career at night. Brian: I take it you mean, when you say taking on too much, that means you had 5 or 6 bands that you were trying to record as well as the sound gigs at night. Sean: It was a lot. I thought for the longest time, Hey, this is no problem, I got this, and then your just like, okay, I'm kind of letting people down, I'm letting myself down so I need to reevaluate. Brian: At what point did you realize this isn't good, this isn't it? Sean: It was pretty much the moment that I was brought into the The Black Cat, which was early spring last year and I new that that was going to take up a lot of my time. I kind of quickly reevaluated my situation and ... It's all learning experiences, especially something like this. There's no rule books and you kinda of halve to make it up as you go. Brian: Make your way. See how it goes. Brian: A lot of tries and fails and experiments and learning it sounds like. You said in there, you mentioned that this was, you started in your 30's. What were you doing before? Sean: I've always been into music and sound. My first job doing sound was at The Old Bayou in Georgetown when I was 20 years old. My first night there was Anthrax, Motorhead, and The Deftones playing. Brian: That sounds like a night. Sean: It was. That's where I got my start and I kind of did it off and on, but then I started doing carpentry for a long time and I owned my own carpentry business. I really just wanted to learn how to build my own house one day or build my own recording studio. After the market collapse I reevaluated that situation and I went back to school to learn Pro tools professionally and that's where I'm at now. Brian: That was your late 20's or early 30's? Sean: When I owned my construction company it was my mid 20's through my mid 30's and I started picking this up around 30, 35, around when my son was born. Brian: Most people are slowing down when there son is born. Look at you go. What do you have in your music collection that might surprise us? Sean: That's a great question. I like movie scores, believe it or not. Brian: Movie scores, so like tell us a top movie score? Sean: For right now I've been listening to a lot of John Byron he was also a masterful producer. He's done Fiona Apple, Kanye West album and Amy Mann. He's done The Eternal Sunshine of the Spotless Mind soundtrack. The things he does is unbelievable with the string sections and the back drops and texture and color that he uses, it's mind blowing. Brian: It is incredible, and it's a way to hear, people compose. The music comes after the show not before. They don't design the movies around the music. Music is designed around the movies, so it's amazing to see that creative element too. Do you have any rules, as a sound guy or whatever? Are there any rules that you have? There's some musicians that listen and there's some local music fans too. Any rules as a sound guy? Sean: Yeah. Supposing that you have a competent sound guy, which there's a lot if us out there. Try to take our advice about the room that we're working in, that's always an important thing. If we ask you to turn your guitar amp down on stage, if your a musician try not to think about that so much as, hey, we're trying to tell you to turn your guitar amp down, we're trying to control the sound as a whole and trying to get everything for the house. So just as an example. Brian: I want to go on record and say that I love that you used guitarists as an example. I'm thinking of a few guitarists of the top of my head who love those loud guitars. Sound men appreciate it when you turn it down, that's ... What other rules? Sean: Basically, try to come into the venue and not have any preconceived notions we've all as musicians had experiences with bad sound guys. And we know what's that like or less than favorable venues or sound systems. As an artist you have to go into a venue and make the best of the given situation. If your getting something less than desirable, push through and do the best that you can do. If your working in a good room with a good engineer, work with that engineer. Make sure that your, there's a give and take in the conversation there ... Because it's basically as an artist, it's your night. It's all about you and sounding engineer is just there to assist you. Brian: The favorite question I always love to ask is, what's one piece of advice that you have to offer? Sean: The reason I've gotten where I've gotten, in kind of a short amount of time, is just because I'm out there and I'm doing it. Really is like you said, it's my life and I make it my life, because that's the only way to really be visible and to make a difference on the scene is to be out there, be doing it, work really really hard. Develop a reputation whether your a sound guy, and artist, whatever you may be. Try to be the best of that and if your really good people will start noticing. Brian: As evidence of the amazing career that you've had from your mid 30's on. your making tracks. That's amazing. Tell folks if we want to find out more about you and follow you, where do we go? Sean: You can go to bluehipporecordings.com, or there's a Facebook page for Blue Hippo Recordings that you can look up or search, or you can find me on Audio Bar on Facebook, which is a podcast that's run out of my studio.